It’s not a contest. Renewable energy is no zero-sum game (or doesn’t have to be, at least), and according to the experts, all of it and then some will be needed to keep global temperatures from rising beyond safe levels. Still, it’s hard not to view the growth of the two leading non-hydro renewable energy technologies – wind and solar – in relation to each other. We reported recently that wind grew quickly in 2014, but solar had itself a very good year as well. And there are signs that it could be in for even more rapid growth. According to the respected “Global Trends In Renewable Energy 2015” report from the Frankfurt School-UNEP Collaborating Centre for Climate & Sustainable Energy Finance, the world poured $270.2 billion into renewable energy in 2014, and more than half the total – $149.6 billion – went into solar. It was the fifth year in a row that solar investment topped wind, and what made solar’s dominance all the more remarkable is that it is dramatically less expensive than it used to be. So each one of those billions of dollars was buying more solar than it used to. Last year, 46 gigawatts of solar PV was installed around the world, a record. 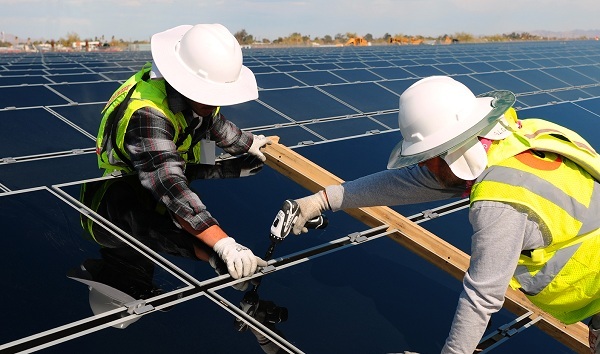 In the U.S., the number was also a record, 6.2 GW of PV, a 30 percent increase over 2013, according to the Solar Energy Industries Association and GTM Research. With 767 megawatts of new concentrating solar power thrown into the mix, U.S. solar capacity climbed past the 20 GW mark. Going forward, solar could have several advantages over wind. First, there’s solar’s versatility. Wind works best at very large scale, and nearly all ($92.4 billion) of the $99.5 billion invested in wind in 2014 went into building big wind farms. Solar can do big, but it can also do small. In 2014, $62.8 billion went into building utility-scale solar, while $73.5 billion went into small projects. In addition, solar can flourish in places where wind struggles – amid the hustle-and-bustle of humanity, in and around cities and towns. For instance, a study published last month in Nature Climate Change estimated that in California, the “built environment” alone could house enough solar to “meet the state of California’s energy consumptive demand three to five times over.” Essentially there is enough roof space that, were it covered with solar panels, this area alone would generate 3 to 5 times more energy than the state consumes! Solar is also popular. In a new survey, U.S. homeowners were asked to name three forms of energy they felt were important to the country’s future, and more named solar (50 percent) than any other form of energy. Another report from solar leads generator SolarLeadFactory showed that this growing interest is coming from places you’d least expect it. Lastly, there’s price. While solar has plummeted in price in recent years (it’s cheaper than power from the utility in many US states), there are indications it could become even cheaper. Way cheaper. The German think tank Agora Energiewende believes that in Europe, solar could fall to 4-6 cents/kilowatt-hour by 2025 and 2-4 cents/kWh by 2050. The solar revolution is officially in full effect. It’s just happening at such an astonishing pace that most people don’t yet realize it. We all want save money, and the low cost of solar is the biggest incentive for switching to renewable energy.